actually, i thought of these as wind-catchers, but the preschoolers exclaimed things like, “oh yeah! a kite!”…so they became kites. the first step was cutting a hole out of the center. any kind of hole. i learned quickly (and should have known!) to poke the scissor through first (thankfully we avoided hurt children). 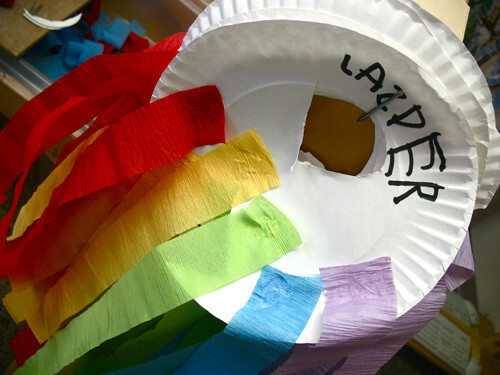 then was the tricky work of choosing streamers and gluing them on in rainbow order. oh, tricky. 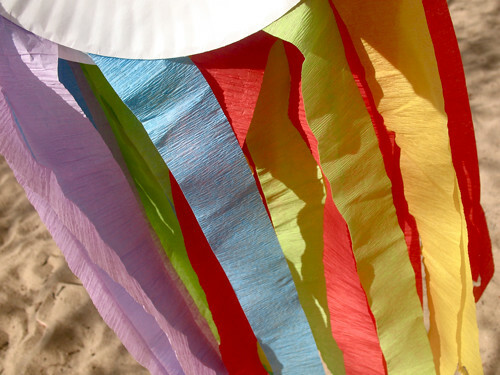 we had beautiful weather these days…great for kite flying. This looks like a lot of fun. 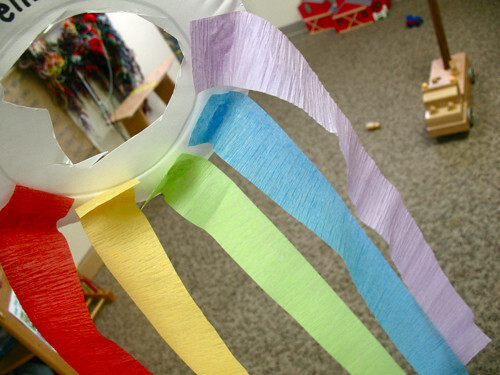 Not sure that we have enough streamers to make the full rainbow, but will definitely have to get them! 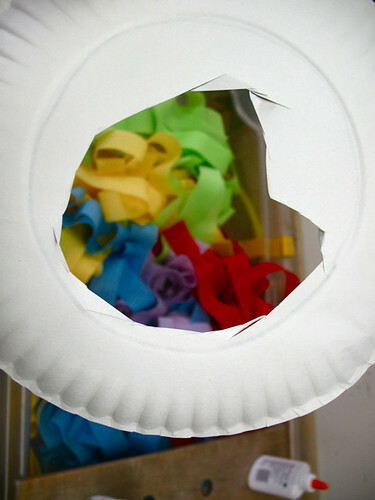 This might work well with different colored yarn (which I definitely have) or even ribbon. Thanks for the great idea! I was wondering if you have any suggestions for onomatopoeia. ha! i had to look it up to remember exactly what onomatopoeia is. there is a cheesy little song i remember now to the tune of “old mcdonald had a farm.” i’d have to google it though. i don’t have activities i’ve done in the past, but now i want to. have you?